Less than a century ago, at the dawn of the aviation age, early, kite-like aircraft quickly developed into powerful, indispensable weapons. The impetus was the First World War (1914-1918), which broke out only a decade after the first controlled flight by a powered machine. During that conflict an estimated 22,800 Canadians joined the British flying services. Some of them, like William Bishop, William Barker, and Raymond Collishaw, were among the top-scoring “aces” of the war and became household names. The Canadian government, preoccupied with raising the large Canadian Corps of ground troops for combat in Europe, did not adequately support three wartime attempts to found a national air service and they all failed. Ultimately, the government created a Canadian Air Force in 1920 as part of the peacetime military establishment. At first, members served on only a part-time basis but, by 1924, it had evolved into a small, permanent professional organization, the Royal Canadian Air Force (RCAF). The new RCAF trained sporadically for war, conducting exercises with warships and militia units, applying First World War tactics. The Armstrong-Whitworth Atlas army cooperation aircraft acquired in 1927, for example, was certainly more powerful than types developed in 1914-1918, but its crews practiced the same skills of artillery spotting and short range reconnaissance that had been the essence of First World War air power. Among their most common tasks was to take young militia officers up for short flights, to show them how readily ground troops could be located from the air and to instill in them the need to camouflage their units from observation and attack. Military training was basic forming only a small part of the RCAF‘s activities. After the carnage of the First World War, Canadians had little interest in armed forces. The new air service therefore had to prove itself useful in peaceful pursuits. 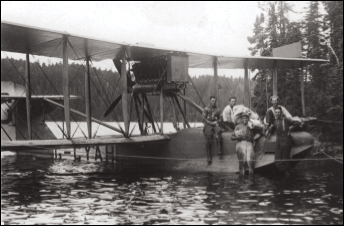 From 1924 to 1935, its main tasks were “Civil Government Air Operations,” which included forestry protection, anti-smuggling flights, mercy missions, and experimental work, especially in the development of equipment and engine lubricants for operations in the Canadian winter. RCAF aircrews also pioneered the air transport of mail. In 1932, during an international economic summit in Ottawa, RCAF aircraft speeded up transatlantic postal services by meeting in-bound steamers in the Strait of Belle Isle, north of Newfoundland, and picking up mail bags which they flew westward. The most important civil operations were air photography flights to improve and expand the mapping of Canada. The program began by using aircraft left over from the First World War and progressed as new machines, cameras, and techniques evolved. The first aerial surveys were close to settled regions, but in 1927-28 a small force wintered along Hudson Strait, reporting ice conditions that would affect navigation. By 1930, RCAF photographic aircraft operated routinely in the Arctic. Some machines, like the Fairchild 71, were imported, but others, like the Vickers Vedette, were designed in Canada to meet uniquely Canadian needs. Many RCAF pilots considered themselves to be “bush pilots in uniform”. Their numbers included such bold adventurers as Squadron Leader Roy Grandy, a peerless test and air mail pilot, and Flight Lieutenant Joseph Mawdesley, whose prowess in Arctic navigation led one admirer to describe him as having “a compass in his head”. The mission of the RCAF changed dramatically in the 1930s. First, budget cutbacks during the Great Depression greatly reduced civil operations. When, after 1935, more money became available, the service’s main objective was to increase its meagre military capabilities. War with Germany, Italy and Japan loomed on the horizon, and Ottawa now realized that air forces were an essential component of national defence. On the outbreak of war with Germany in 1939, the RCAF, which still had only 4000 personnel and 195 mostly obsolete aircraft, faced gargantuan challenges. On the vast, largely undeveloped, coastlines, the service built a chain of airports to operate over 300 modern maritime patrol bombers and fighters. Out over the Atlantic, these forces played an enormous role in protecting the essential shipping routes linking North America to Britain against German submarine attack; by the summer of 1943, Canadian patrol bombers based in Newfoundland were flying missions right across the ocean to Iceland and Northern Ireland. On the Pacific, in 1942 RCAF squadrons based in British Columbia flew up to Alaska to assist US forces in defending the far reaches of the Aleutian Islands against Japanese incursions. Defence of Canada’s coastal frontiers and of Allied shipping at sea were only a part of the RCAF‘s wartime endeavours. When, after the fall of France in the spring of 1940, Britain came under German bombing attack, Canada sent its only squadron of modern fighters to help. This unit, No. 1 Fighter Squadron, operating Hurricanes, together with individual Canadian pilots serving in Britain’s Royal Air Force (RAF), joined in the intense Battle of Britain that, by the autumn, defeated the German air offensive. Beginning in late 1940 these Canadian airmen were joined by hundreds and then thousands of other RCAF aircrew who, together with British, Australian, New Zealand and flyers from other Allied nations, had been trained in Canada under the British Commonwealth Air Training Plan. The RCAF had undertaken this huge enterprise at Britain’s request, building and staffing scores of training airfields and over a hundred schools across Canada. Of the 131,000 pilots, navigators and other air crew graduated during the war, some 70,000 were Canadians, and most of them served overseas — the vast majority in Britain, but also in Africa, Burma, India, Ceylon, northern Russia, and the Mediterranean theatre, including the island of Malta when it was under siege by the German and Italian air forces. RCAF air crew served in all types of roles in all types of aircraft: transport, anti-submarine patrol, strikes on enemy shipping, and fighter combat, both against enemy air forces and in ground attack in close support of armies. By far the greatest commitment, however, was the bombing offensive against Germany. The largest Canadian air formation overseas was No. 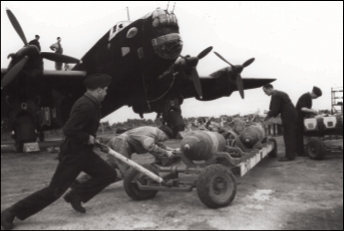 6 (RCAF) Group of the Royal Air Force’s Bomber Command, which by mid-1944 included fifteen squadrons, each equipped with twenty huge four-engined aircraft that could individually carry up to ten tons of bombs. One of the peculiarities of the RCAF experience was the manner in which its personnel were scattered throughout British formations. In the British Commonwealth Air Training Plan Agreement of December 1939, the Canadian government had insisted that RCAF personnel posted overseas should be incorporated into distinctly Canadian squadrons. In practice, British indifference to “Dominion” units and Canadian deference to British operational imperatives slowed the pace of “Canadian-ization”. The fact that Canada, until late 1942, paid only a portion of RCAF costs overseas (with Britain paying the rest) weakened arguments in favour of Canadianization. As a result, approximately 60 percent of all RCAF personnel serving overseas spent some or all of their careers in British rather than in Canadian units. That group, known to many as “The Lost Legion”, has been the most difficult to chronicle, as their operational records are part of RAF, rather than RCAF, documents. Only after Canada assumed full financial and administrative responsibility for its air forces overseas, was the government able to exert effective pressure for Canadians to be posted to the 47 RCAF squadrons eventually sent overseas. Even then, large numbers of RCAF personnel continued to serve in British units. Altogether, nearly a quarter of a million Canadians, including over 17,000 members of the Women’s Division, served in the RCAF at home or abroad during the Second World War. Canada’s air force became the fourth largest among the Allied powers. Many individuals distinguished themselves. Flight Lieutenant George F. Beurling, with 31 1/3 enemy aircraft destroyed, was among the leading British Commonwealth fighter pilots of the war. Flight Lieutenant Richard Audet, piloting a Supermarine Spitfire fighter, destroyed five German fighters in a single sortie. Flying Officer Kenneth Moore (one of the “Lost Legion”) sank two German submarines within the space of 22 minutes, a feat unmatched by any other pilot. Air Vice-Marshal Clifford McEwen, one of the RCAF‘s old hands, had been a high-scoring fighter pilot in the First World War (22 victories) and a pioneer of aerial forestry protection between the wars. From early 1944 to the end of the war, as Air Officer Commanding, No. 6 Group in Bomber Command, he made Canada’s largest overseas air formation as efficient as that in any air force in the face of myriad technical challenges and terrifying losses in the air battle over Germany. Two Canadian airmen received the Victoria Cross, the British Commonwealth’s highest decoration for valour in combat: Flight Lieutenant David Hornell, who successfully bombed a German submarine even as his aircraft was being shot to pieces, and then gave up his life to save his comrades; and Pilot Officer Andrew Mynarski, who sacrificed himself while trying to save a fellow crew member as their burning bomber was plunging to the ground. Among non-flying personnel, Wing Commander Ross Tilley treated horribly burned airmen, using techniques developed in concert with his more famous British colleague, Sir Archibald McIndoe. Much of their work was so radical, even experimental, that their patients became known as “The Guinea Pig Club”. Many did not survive. Over 17,000 members of the RCAF lost their lives during the Second World War, nearly 10,000 of them in the bombing offensive against Germany and occupied Europe. After the defeat of Germany and Japan in 1945, the RCAF, like the rest of the Canadian armed forces, rapidly demobilized to a strength of less than 20,000 personnel. Many of the military airfields became civilian airports, thus providing much of the infrastructure for a national air transportation system that had been lacking before 1939. The RCAF itself returned to some of the civil operations that had so marked the service’s early years, including notably air mapping, pressed forward once again on a much larger scale, using sophisticated equipment and techniques originally developed for air reconnaissance. The air force also became the national instrument for search and rescue, an important role with the growth of international air travel. Deepening tension between the western powers and their wartime ally, the Soviet Union made it clear that Canada could not again give military aviation the low priority it had held in the 1920s and early 1930s. The cooperative arrangements Canada had made with the United States during the Second World War for the defence of North America continued after 1945. The performance of the latest aircraft made it possible for Soviet bombers to attack from across the Arctic circle, a threat that became immeasurably more menacing in 1949 when the Soviets demonstrated their emergence as a nuclear power by exploding an atomic bomb. Canada, in effect, had become the avenue for potentially devastating strikes on American cities, and there was no reason to believe Canadian cities would be excluded. Beginning in the late 1940s, Canada began to integrate its air defences with those of the United States, culminating in the signing of the North American Air Defence agreement in 1957. The agreement created a unified continental command, known today as the North American Aerospace Defence Command (NORAD), with a US commander and a Canadian deputy commander. Close military co-operation with a great power, no matter how friendly, can too readily become dependence. Just as Canada built up its fighter strength so that Canadian forces exercised control over Canadian airspace within NORAD , in the late 1940s, the country revived its independent capacity for the aerial surveillance of its ocean frontiers. The RCAF had first undertaken ocean patrol in the early 1920s, with First World War Curtiss HS2L biplane flying boats. In the late 1940s the service once again used war-surplus aircraft, modified Avro Lancaster bombers, for the task. These were replaced by large, purpose-built Canadair Argus maritime patrol aircraft in the mid-1950s, which in turn gave way in the early 1980s to the Lockheed Auroras that carry out maritime surveillance today over the Arctic, Atlantic, and Pacific Oceans. The Aurora is filled with advanced electronic detection devices, and can carry powerful weaponry to counter hostile submarines capable of firing nuclear-tipped missiles at North American cities. The Auroras also keep watch for breaches of fishing regulations, for smuggling, and other legal violations in Canadian waters, as the RCAF did in the 1920s. Canadian contributions to United Nations (UN) operations, from the Korean War (1950-53) to the present day have chiefly involved ground troops. Canadian aircrews have provided logistical support but relatively little combat strength. Thus, during the Korean War, a mere 26 RCAF fighter pilots were seconded for abbreviated tours to American squadrons; they were sent as much for training as for battle. The principal RCAF operation relative to Korea was a four-year, trans-Pacific air transport program. These contributions were dwarfed by the army’s commitment of an infantry brigade. Whether in the Congo (1960) or in Haiti (1995), the Canadian aerial presence in UN operations has most commonly taken the form of transport aircraft or helicopters. In 1949, in response to the Soviet threat in Europe, the Allies created the North Atlantic Treaty Organization (NATO) as a defensive military alliance. Canada was a charter member of NATO and began stationing forces in Europe in 1951. Unlike UN operations, however, the RCAF was, from the start, a powerful element in Canada’s overseas military commitment. In the 1950s, No. 1 Air Division, based in Europe, deployed twelve squadrons of North American Sabre fighters (later changed to eight squadrons of Sabres and four of Avro CF-100 all-weather fighters). Beginning in 1965, No. 1 Air Division was gradually reduced in size, although more modern aircraft allowed it to remain a formidable force. This was still the case in 1990-91 when CF-18 aircraft and crews were moved from European bases to participate in the Persian Gulf War. In 1992, with the end of the Cold War, Canada withdrew its air and ground forces from Western Europe but it remained a member of NATO. Canadian troops have served in various international missions in aid of European security since 1992, including NATO ‘s 1999 military action intended to protect Kosovars from “ethnic cleansing” in Yugoslavia. Canadian CF-18s participated in these air strikes from the beginning. “Peacetime” operations have demanded their own price. Between 1945 and 1965, more than 300 members of the RCAF died in the course of flying operations. Upon the unification of the three armed services, army, navy, and air force flying organizations merged, although some distinctions remained. The work has continued to exact its toll. While most casualties have resulted from training accidents, others have been due to operational hazards verging upon combat situations. In August 1974, for example, a Canadian Armed Forces Buffalo transport engaged on UN peacekeeping duties was shot down by a Syrian missile; all nine persons aboard were killed. In the past 75 years, the RCAF was created as a permanent force under army control (1924), given independent status as an equal of the army and navy (1938), and finally merged into the integrated Canadian Armed Forces (1968). A distinct Air Command was recreated in 1975 with headquarters in Winnipeg. In July 1997, this was renamed No.1 Air Division (reviving the previous NATO formation term) while the post of Chief of Air Staff was recreated at National Defence Headquarters. This officer now coordinates and directs the work of thirteen bases (known as “Wings”) across Canada, engaged in tasks ranging from training to the dispatch of fighters, helicopters and transport aircraft aboard. Canada has a long and storied history of military aviation, global in its reach, embracing combat, civil duties, humanitarian missions, and peacekeeping. The post-Cold War world is not proving to be a peaceful place. In these circumstances, the air power of Canada, twice engaged in combat in the 1990s, has an undiminished role to play in helping to maintain international stability and defend Canada’s interests. The challenges which lie ahead, including possible participation in international crises, the ongoing need to defend Canada’s territory, and a growing commitment to assist civil authorities in domestic emergencies, will amply bear out the motto of the Royal Canadian Air Force: Per Ardua Ad Astra — Through Adversity to the Stars. Douglas, W.A.B., The Creation of a National Air Force, University of Toronto Press and Department of National Defence, 1986. Greenhous, Brereton, et. al., The Crucible of War 1939-1945, Ottawa, Department of National Defence, 1994. Hitchins, F.H., Air Board, Canadian Air Force and Royal Canadian Air Force, Ottawa, Mercury Series No. 2, Canadian War Museum, 1972. Milberry, Larry, Sixty Years — The RCAF and CF Air Command 1924-1984, Toronto, CANAV Books, 1984. Roberts, Leslie, There Shall be Wings, Toronto, Clarke, Irwin, 1959. Wise, S.F., Canadian Airmen and the First World War, University of Toronto Press and Department of National Defence, 1982.